Harley-Davidson beat on both the top and bottom lines on Tuesday, saying its “More Roads to Harley-Davidson” plan was making progress. US sales slumped 13% versus a year ago. The motorcycle maker also confirmed its full-year shipment forecast. Shares were little changed following the results. Harley-Davidson reported third-quarter results Tuesday morning that blew past Wall Street estimates. Shares were little changed ahead of the opening bell. The motorcycle manufacturer earned an adjusted $US0.78 a share on revenue of $US1.12 billion, easily beating the $US0.51 and $US1.08 billion that analysts surveyed by Bloomberg were expecting. However, US sales slumped 13%, making for their biggest drop in at least six years, according to Bloomberg. Its gross margin came in at 30.9%, topping the 29% that was anticipated. 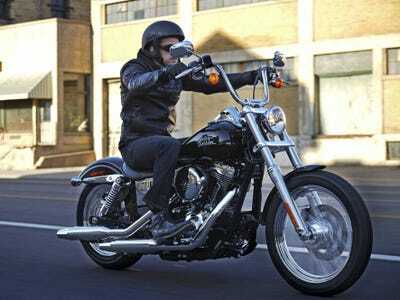 Harley confirmed its full-year shipment forecast of 231,000 to 236,000 motorcycles. “Third-quarter progress tracked to our plans with numerous highlights including another quarter of improved international retail sales growth and increased year-over-year earnings per share,” said Matt Levatich, the president and CEO of Harley-Davidson Inc.
Harley is engaged in a decadelong turnaround plan aimed at finding younger riders. In July, the company revealed its “More Roads to Harley-Davidson” growth plan through 2022 that includes new products, broader access, and stronger dealers. The company has found itself under the ire of President Donald Trump in recent months. Back in June, Harley announced plans to shift production of its European Union-bound motorcycles from the US to international facilities over the threat of tariffs by the European Union that Harley said would have an annual impact of $US90 million to $US100 million, adding about $US2,200 to the cost of each motorcycle. Two months later, Trump tweeted his support for boycotting the motorcycle maker if that occurred. “Many @harleydavidson owners plan to boycott the company if manufacturing moves overseas,” he said. 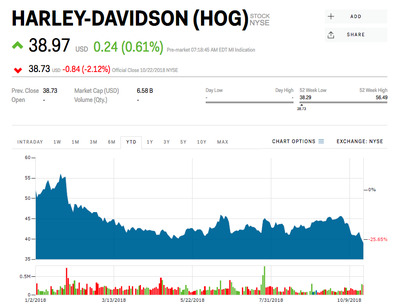 Harley shares were down 24% this year through Monday.